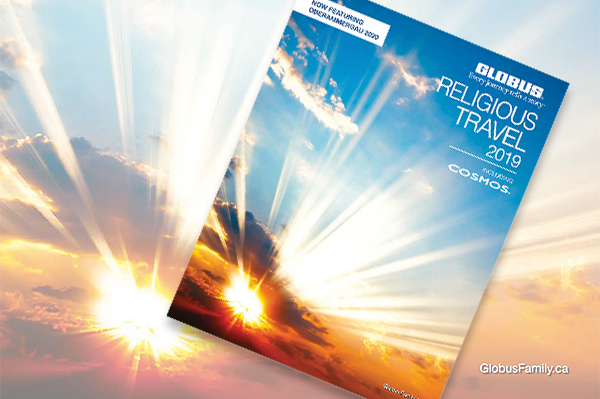 The Globus family of brands in Canada has launched its 2019 Religious Travel brochure, featuring 10 tours, each designed to allow Christians to explore the roots and stories of their faith with fellow believers. The escorted tours, offered by both Globus and its value-brand cousin Cosmos, are available throughout Europe – including Italy, France, Spain, Portugal and Ireland, as well as to Israel and Jordan. There are three new Cosmos tours, a week-long Shrines of Alpine Europe, nine-day Shrines of Northern Italy & Rome and the 14-day Shrines of Italy. Tours range from six to 20 days and many are geared to Roman Catholic travellers and include masses, while Cosmos’ Biblical Israel tour is geared specifically to Protestants. The company also has 14 tour options to the Passion Play in Oberammergau, Germany taking place in 2020. This includes one featuring an Avalon Waterways European river cruise. “We are the only mainstream tour operator to have a faith-based division,” says Stéphanie Bishop, managing director for the Globus family of brands in Canada, adding that when planning the itineraries the company takes enormous effort to create a balance between faith and fun. A tour may include, for example, the chance to reflect in the Basilica of St. Francis of Assisi as well as the thrill of entering Venice by private boat. Globus tours feature VIP access to must-see sites and behind the scenes local experiences. These tours are very popular with groups, such as church groups, and discounted rates are available for groups as small as eight in number. The company is also happy to provide its expertise in customizing a group tour for as few as 20 travellers. Or, new this year, Globus is happy to make any of its itineraries private, for two up to 24 passengers. The company also has an Early Booking Bonus program in place: book any 2019 Globus Europe (excluding Escapes by Globus and 2020 Oberammergau tours) by Nov. 27 and save 10%. With Cosmos, book by Oct. 23 and save $50 per person.